We are announcing with pain and regret the death of Traditional Haitian Politic with the passage of this Election disaster in Haiti. This natural disaster, although unavoidable, took the lives of so many who were dear to the Haitian people. The funeral will be held on May 14, 2011, in Port-au-Prince, Haiti in front of many Haitian and International observers. Like many things we are use to for a long time, it will be hard for us to accept that those people who have dominated our political life for so long are no more. The "Haitian Joudalist" is saying: "Traditional Haitian politic is over"
We are going to find out that this election was wan not based on the capacity of the candidate to present a realistic plan for the problems of Haiti, not because the candidates have decades of experience in practicing politic, not because he or she has been studying politic for years or not because he or she comes from a family of politicians. Michel Martelly was able to win this race because he has a message that resonates with the youth that represents the majority of the Haitian population. We also found out that Michel Martelly did not have to say much. He just needed to be one of them. According to CIA world Factbook, in 2011, the total population in Haiti was estimated to be around 9.7 million people. 38 percent of them was between 0 and 14 years. The median age in Haiti is 21 years, compared to Monaco: 48.9., Japan: 44-6, and Germany: 44.3. In comparison to the other countries in the world, Haiti has a relatively young population which is growing at a much faster rate than the other countries. This difference in age will affect the Haitian society in a fundamental way. For one, it will influence the political system in Haiti and change the landscape for years to come. We have politicians in Haiti who have been trying to become president for several generations. These career politicians believe that they are entitled to the chair. I would like to give these politician an advise: "Wake-up and smell the coffee", "Your message has expired". 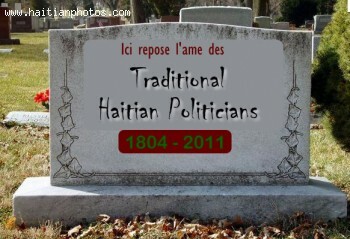 Do you think the era of Traditional Haitian politicic is over? Who do you see as president after the 5 years term of Michel Martelly? Just give the Man a chance to prove himself. It's time to get together for a better tomorrow. it took a lot time to get there, a lot.1915 1957 1971 1986 1991 2004 but I'm happy to see that we moving forward politically an I'm sure good days are ahead.long live haiti I never doubt our capability but it takes time(paris pat bati nan you jou). remember france who colonised haiti for about 400 years had so many revolutions before the got it correct and we know the story of so many country in europe asia africa. Se yon bagay pou wou fe jouda e yon lot' bagay pou'w passe sa ky rete nan respe ty peyi'm nan pou'w pase'l an ba pye'w. Se vre ou te dy ou pa Ayisyen, mem sa pa anpeche ou kapab' respekte yon peyi. Tout peyi merite respe. It's one thing for you to write and be spectacular at the expense of Haitian Politics. This is it, that's all I have to say. All Haitian clubs should be open on the day of the inauguration so that we can watch the ceremony live and share the love that is in our community now more than ever. I plan to contact SOBs on Houston & Varick Manhattan NY to see if this possible. If anybody knows the management there can you get it started so that we can get moving on this, and let us know what's up. La Mission a observé de près la tabulation du vote à travers une présence constante dans le Centre de tabulation. Elle a pu ainsi constater que des efforts importants y ont été conduits en vue de mettre en �"uvre les recommandations de la MOEC et de la Mission d'experts de l'OEA et de garantir la transparence et l'intégrité des résultats. Il est clair qu'en général, la vérification des Procès-Verbaux (PV) était plus rigoureuse que lors du premier tour. Ceci dit, les PV présidentiels ont bénéficié de davantage de temps et d'attention que les PV législatifs. Manno, you are very late with your news because the population have been gettin on Michel's case for 18 years, but nothing like the crazy passion they have shown in going after him since November 28, 2010. I have a feeling that you are ready to start your campaign to be the next president in 2016. Hey, you never know i might just vote for you. Show us what you got. Or, are you just one those mouths flaping your tongue trying to bite your teeth. What will you be doing in August 14, 2011 - still drinking that lousy cheap wine and thinking about beautiful ideas such as the one you just shared with us. We need to give the guy a chance. Michel Martelly has not even been in office yet and you already know the population will go after him. This is one of the biggest problems in haiti and with Haitians: they can't see anything positive. The only way Haiti will change is if we Haitians change. How long do you think the Haitian population is going to wait before they start getting on the case of Michel martelly. Haitians believe the the government is responsible to give them everything. How is Michel Martelly going to accomplish all these that he promissed. How will he provide free education to all the children in Haiti.